The 2018 Nobel Peace Prize has been awarded to Nadia Murad (pictured) and Dr. Denis Mukwege, a gynecologist from the Democratic Republic of the Congo, for their efforts to combat wartime sexual assault. The pair were named for their work to highlight and eliminate the use of sexual violence as a weapon of war, according to the Norwegian Nobel Committee. Murad was honored for her refusal "to remain silent and ashamed of the abuses to which they have been subjected," the committee said. At age 25, she is the second-youngest peace prize recipient; Malala Yousafzai was the youngest at age 17. NPR profiled Murad in August. This story has been updated. 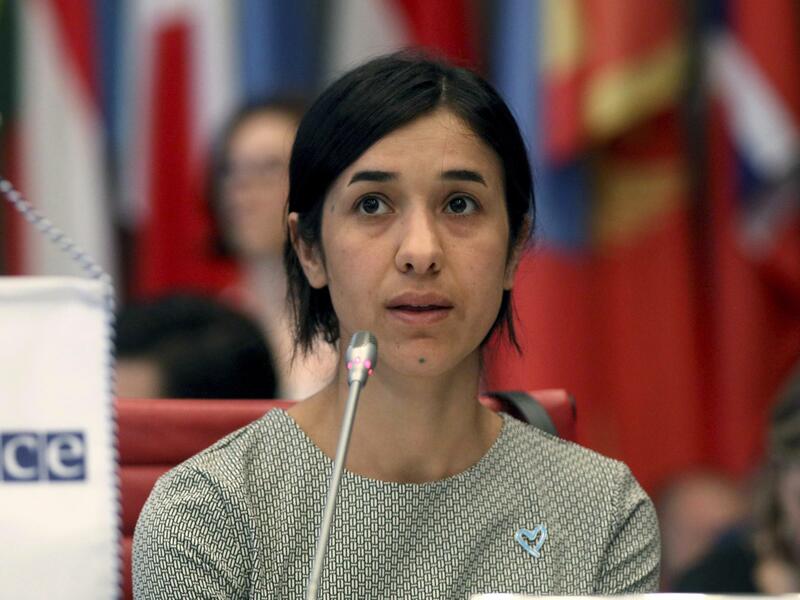 In August 2014, Nadia Murad was one of thousands of Yazidis who were captured by ISIS and forced into sexual slavery. Three months later, she escaped through a door that one of her captors left unlocked. Murad has shared her painful story with international media outlets over and over to show the world what happened to Yazidis. She has become a voice for captive women and girls in the process. She urges women who have faced sexual violence to reclaim their lives. "The hope of ISIS was to break the Yazidi community," she says. "But for survivors especially, going back to their lives and getting married and making a life and working, it's basically making sure ISIS did not succeed." When she was named the U.N.'s first Goodwill Ambassador for the Dignity of Survivors of Human Trafficking, Secretary-General Ban Ki-moon praised her courage. "Nadia survived horrific crimes. I cried when I heard her story. But I didn't only cry out of sadness," he said. "I was also moved to tears because Nadia has so much strength, courage and dignity. She rightly calls for a world where all children live in peace." Yazidi women and girls who have escaped ISIS or are rescued face an array of problems, Pari Ibrahim, founder and executive director of the Free Yezidi Foundation, tells NPR. "A lot of the women have difficulty trying to build a new future. They don't have a boyfriend or get engaged; they are living in the past. It's not easy for them to switch back to the here and now and to live daily life." Murad, who has tried to loosen shackles of the past, announced in August her plans to be married. Her fiancé, Abid Shamdeen, is a former interpreter for the U.S. Army and a human rights activist. "Despite all the difficulties that we were going through, he was always there. He was supportive," Murad tells NPR. Shamdeen says of Murad: "Obviously she's a very brave woman. She is courageous, she's smart, she's strong. And she's a fighter." Murad says their engagement shows Yazidi survivors that "it's possible to live their lives again and to not believe the propaganda of ISIS — that they will not be accepted back into the community."